If you are really lucky, you visit a great rv dealership that is close to home and they have in stock the perfect rv at a great price. Most of us aren't that lucky. You are still lucky if they have something you like enough to buy. Most of us can accept a few compromises for the convenience being able to purchase without a wait. I'm sure many of us just get a general idea of what we want to buy, visit the rv dealer close to home, and pick from whatever is available. The offerings may have features we didn't really need. We'll have to accept paying for them anyway. The offerings may not have certain features we really desired. To buy is to accept living without them. Such compromises are par for the course. When at a dealer communicate what you like & don't like. It can help them find you your perfect rv. It also helps them know what their customers are interested in. The next time they order new stock they'll have a better idea of what options their customers are interested in and can order appropriately. The other approach is do research to find the manufacturer who has the perfect model with all the features you want without compromise - and then order yourself one. You may find that perfect model. Thankfully many manufacturers offer many options and some degree of modest customization. Based on their existing models they may agree to the incorporate the special features you want even if the feature isn't one of their regular options. Your rv will then be built to order. 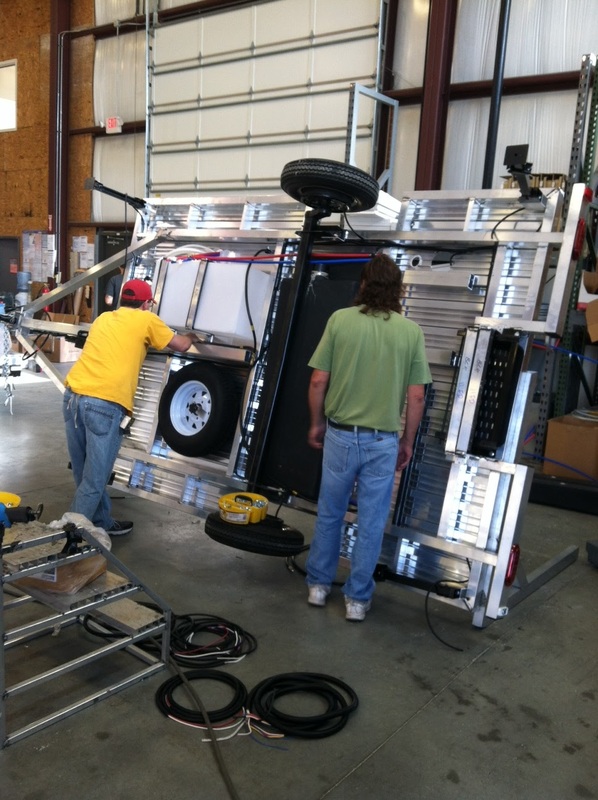 It can be fun getting your rv built to order. That's what we did with our new little trailer. 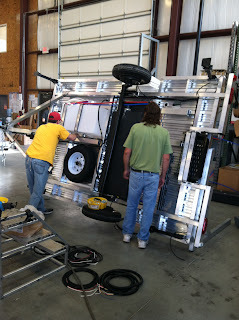 The picture shows our Camplite being built at the Livin' Lite factory in Wakarusa, Indiana. The sales guy emailed us the picture to show progress on the construction. In this case it shows the aluminum frame (25-30% lighter than steel) and the extruded aluminum floor system that will never rot. You can also see the tanks and where Livin' Lite puts the spare tire. Our Camplite is based on a standard model. (CL11FDB). We chose the options we were interested in and asked if they could do a few further customizations. Scott Tuttle, the owner of Livin' Lite, reviewed our custom requests with his design team and got back to us on what they could and could not do. They balanced our wishes against practical concerns like their production flow and re-engineering implications. With some back and forth we all agreed on the specifications, paid a deposit, and they put our unit in the queue for production. To that point the process had taken a few months. That was mostly because we had a fair amount of back & forth in email discussions. If our requests had been more straightforward I'm sure the process would have been much quicker --- perhaps even just a week or so. With hindsight I now see that for the process to go smoothly it is important to avoid developing unrealistic expectations and just go with the flow. If you ordered custom trailers many times you would of course develop expectations. They would be based on something. When you do it the first time there are lots of factors you will be unaware of. What might seem like a simple matter to you might involve considerable internal dialogue at the manufacturer. Therefore it is not reasonable to expect to make a custom request and have it resolved overnight. You'll be much less stressed if you slow down and let the process happen. In the back & forth we viewed it as if they were doing us a favor. It was because throughout that process we were asking a lot of them yet they had no guarantee that we would eventually agree on a price. They were doing research and carrying on an internal dialogue to help us have the trailer we wanted. I write this because I can imagine other buyers might get impatient with the process and have unrealistic expectations. If a manufacturer will consider your requests for customizations, give them the time it takes to work them through. Its not like they can drop everything to help you. Maybe they would if you were ordering 20 trailers. If you understand they may get requests everyday that they spend time on but that don't necessarily result in orders, then perhaps you'll be grateful that they are willing to help you. The result can be a great experience of working with talented people and having a trailer built just for you. A trailer that meets your requirements without compromise. Appreciated your blog. We recently ordered a 13 QBB. Took quite a bit of research to find a manufacturer with a product to accommodate a lower tow weight vehicle. We also look forward to hanging out in areas with our trailer and kayaks. John & Carol of AZ. Cheers on ordering your Camplite 13QBB! I trust it will be everything you expect. While you wait for it to be built there's a couple purchases you should consider. First is getting suitable high amp-hour-rated deep cycle battery or batteries. Don't cheap out on your battery or you'll regret it. I suppose if you'll always be at serviced campgrounds the battery isn't that important. If you'll be doing any unserviced camping - it is very important. Second, consider getting a BAL Leveler. It is such a useful thing! So much easier than getting one wheel up to the suitable height on blocks. With the BAL Leveler you just slip it under the wheel (it sort-of hugs the bottom of the tire) and crank the trailer level. E-Z!